Find out how to use a grocery price list to figure out what’s the best deal. If you’ve been studying grocery sales, you will start to notice that not all sales are really a good deal. And sometimes buying an item in a bulk pack is not necessarily cheaper. It gets confusing at first since every store has a different sale and you don’t know which one has the best deal. Sometimes it gets overwhelming when I’m looking through sales flyers. The key is to be know what the lowest price is. Our grocery bill is the next largest bill after rent. So it was definitely worth my time to figure out how to do this. And I want to stay a stay at home mom. As I read a lot of frugal living and stay at home mom blogs, I’m learning about the grocery price list. A grocery price list is a record of your past purchases on items you buy the most so you can determine which store had the lowest price on a particular item. You can even go a step further and have one page per category like for baby items, frozen foods, paper goods, etc. Do what works best for you. Yesterday, as I was waiting for my tires to be changed at Costco, I had 2 hours to kill. I decided that it was the perfect time to go through the whole store and record all of the items I usually buy. Since my daughter wasn’t with me, it made it easier. I walked down every aisle and recorded the item, size, and price into my phone. Anyone can do this but you just have to invest a little time. You can get a lot done in 10 minutes of tracking. 1. Track the prices of 5 – 10 items you buy most often. This is so you don’t get overwhelmed and give up. You probably know some of the prices in your head but write it down. 2. Use a calculator to figure out the unit price (price divided by unit). Example: $24.99 divided by 20 lbs = $1.25/lb. 3. Highlight which store has the lowest price. You can create your own grocery price list with a simple notebook, binder, or Excel spreadsheet. Anyone can do it. From utilizing a grocery price list, I found that it’s more cost effective to make my own almond butter in a food processor. I noticed that the prices of almond butter has been rising, even at Trader Joe’s. It used to be $5.99/lb, the same cost as the roasted almonds. But now it has jumped to $7.99/lb. for a jar of almond butter. I can buy roasted almonds and grind them myself for $5.99/lb and save $4 a month. 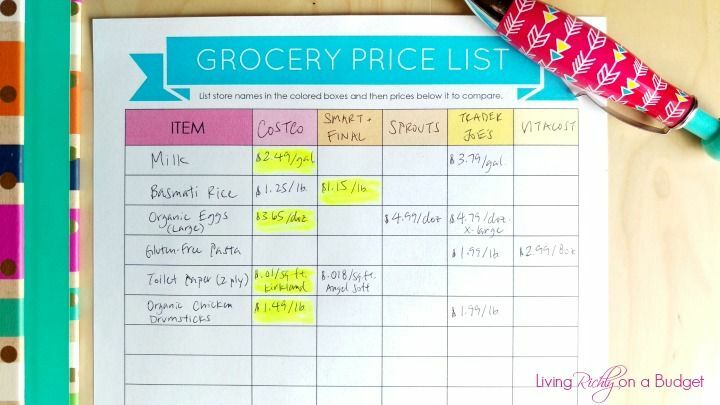 Do you use a grocery price list? How do you find the best deals? 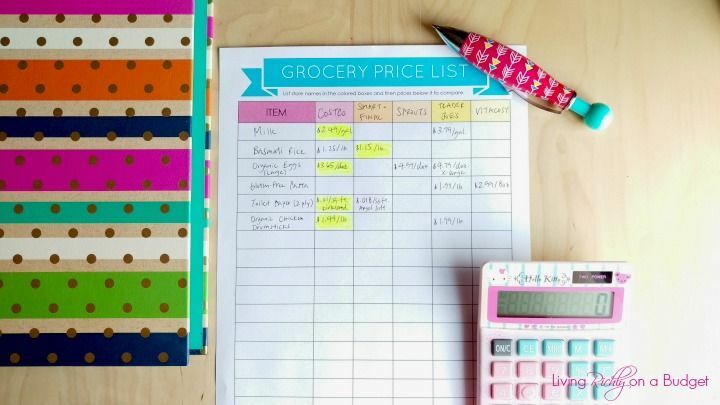 COMING SOON: The Grocery Price List printable (pictured above) is part of Meal Planning Made Easy, a 24-page ebook with printables to help you start meal planning. This whole “creating a grocery price book” is kind of an overwhelming concept for me. I’m a college student on an incredibly tight budget, and I want to start good financial habits now. Could you give me any more detailed tips on how to start and maintain a price book? Hello, I just want to make sure you know that now Walmart and Target price match. So maybe that can help your followers. It helped me by school supplies for my 4 school age kids and purchase a computer and printer. I saved enough for the big buy. So thanks keep up the helpful info. Hi Fanny, great ideas! Was wondering when making a price book, how often should one update the unit price as store prices change over time? Thanks!! That’s a great question. Once a quarter is a good time or whenever you notice a price change.